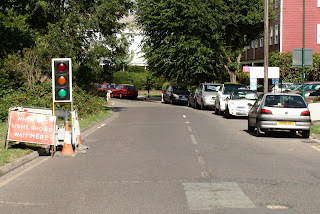 The WORCESTER PARK Blog :: What's The Hold Up? An odd sight greeted me at the top of Green Lane this afternoon. A set of temporary lights were stopping cars in each direction alternatively while nothing unusual occurred in between them. No works, no holes being dug, nothing. On asking a nearby gentleman in a high visibility vest why cars were being held up unnecessarily, he first asked me if I was the Worcester Park Blogger! (Word gets around!) He then said they had only been up there for less than half an hour and work would be beginning within the next half an hour. This was at about 3:40pm so I’m guessing we are talking about the hour from around 3:15 until about 4:15 when cars have had to just stop for nothing. I understand they take time to set up but asked why they were running and not covered up until they were actually needed. This seemed to be news to him, as he had not realised they were currently running. Admittedly (as you can see from the photo) it is not as easy to see the lights from the South end where he was, as it is from the other end. I decided not to embarrass the poor man any more. He was very courteous and probably didn’t relish being the official spokesman trying to explain why cars were being made to wait for no reason. This is all part of the gas pipe replacement works and I will add here though that from my perspective, the people doing this work have generally been getting things right. Sean and his team have been very pleasant every time I have gone to annoy them. And they have received several compliments about their professionalism, which let’s face it, for a utility company to get actual compliments they have to be doing a pretty good job. However holding up traffic for no reason is just one of those things that I find particularly irritating. It is the epitome of inefficiency and indifference to the many important things other people have to get done during their day. I hope we will see the level of professionalism with regard to traffic light management raised to the level we have seen in other aspects of this work. 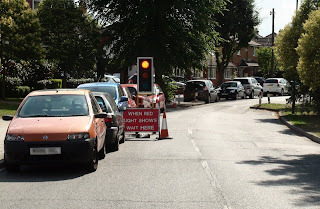 Luckily there were no queues at the lights while I was there.